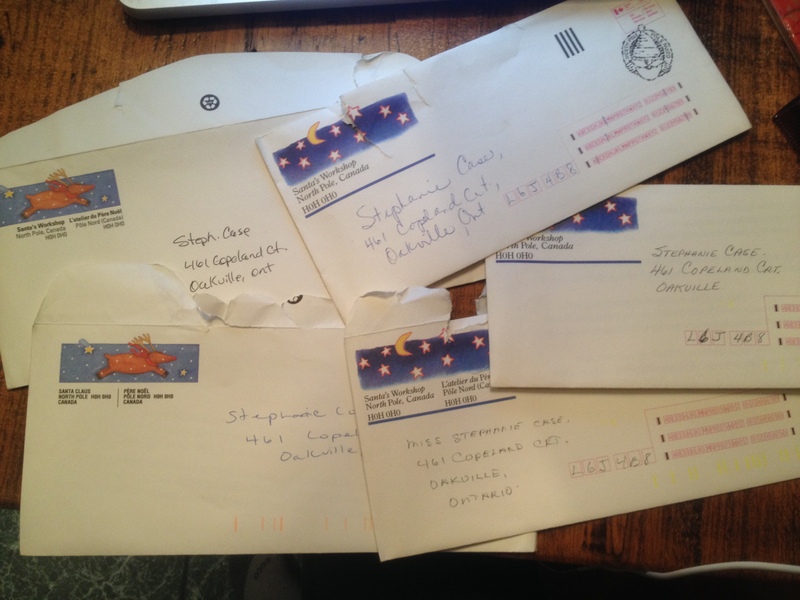 Year after year, my siblings and I would wait for our reply letters from Santa in the mail. When they finally arrived, we would rip them open and painstakingly read each word aloud, eyes twinkling with news of the elves busily working away in the workshop. Our little heads would nod solemnly when we read about how well Mrs Claus was keeping track of everyone to make sure that they didn’t forget anything before the ‘big day’. One year, 1995 to be exact, I opened my letter and began to read the first few words… “Mon petit chou, Tu m’as tellement fait une belle surprise… et quel plaisir j’ai eu a lire ta letter!” Quel horreur. 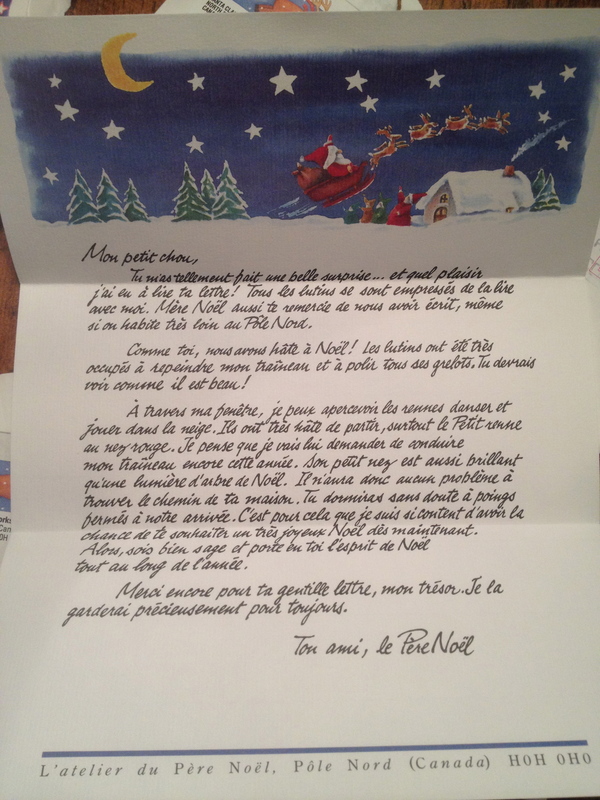 Santa had sent me a little French Canadian girl’s letter. The corners of my mouth started to turn downwards and my little brown eyes widened in despair. I mean, I was 13 at that point, so I knew that Santa wasn’t really a person. I had learned at a much younger age that the white-bearded man in the red suit wasn’t the one who brought me gifts every year (rather it was the black-moustached man in the pinstriped suit named Dad who placed gifts under the tree, and the brown curly-haired woman in the 80s style shoulder-pads named Mom who filled my stocking). 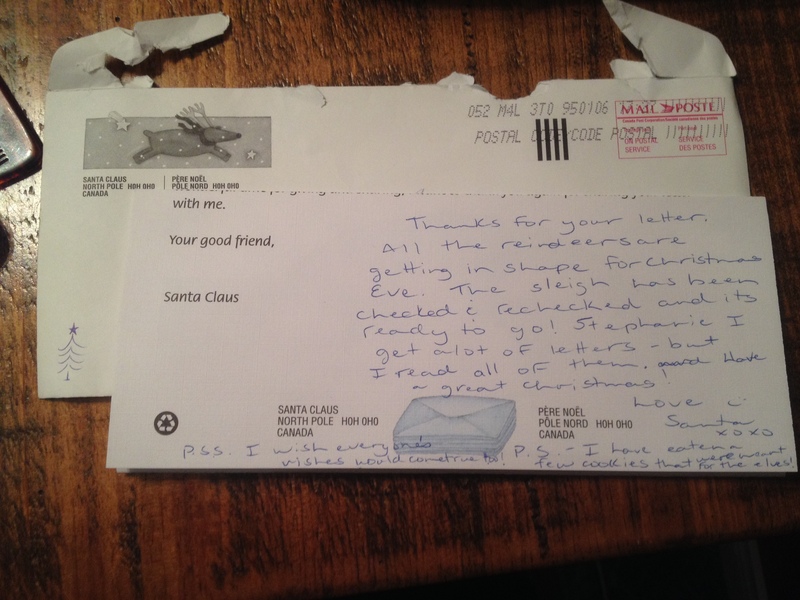 However, I hadn’t given up on the magic of Santa Claus… nor in the tradition of Canada’s postal workers volunteering to read letters from children across Canada and replying under the pseudonym of Santa. What is this world coming to, I thought. Did ‘Santa’ aka Canada postal worker #2379 even bother to read my letter? Were any of my letters over the years read?? I decided to put him or her to the test. I got out my rainbow-coloured writing paper and my best glitter pen to write a second letter to Santa. I explained the error that had occurred and again politely requested world peace. However, in order to make sure that my letter was actually being read this time, I asked ‘Santa’ aka postal worker #2379 to draw a Christmas tree on my reply letter. If I only got a standard reply with no tree, I would know that this Santa-writing thing was complete BS. If I got a reply with a tree, then I would know that all of my letter-writing efforts over the years hadn’t gone to complete waste. Yes, it was sneaky, but my faith in the spirit of Christmas was at stake. Thanks for your letter. All the reindeers are getting in shape for Christmas Eve. The sleigh has been checked and rechecked and it’s ready to go! Stephanie, I get a lot of letters – but I read all of them. Have a great Christmas! Love, Santa xoxo 🙂 p.s. I have eaten a few cookies that were meant for the elves! P.p.s. I wish everyone’s wishes would come true too! At last. My faith in Santa, and in Canada’s postal workers, was restored. I don’t know why it was so important to me that year, but it meant something that this person had taken the time to open my letter, respond to my silly request, and write back with a personal message. Gosh, was I ever precocious or what? I didn’t write any more letters to Santa after that year… but I’m thinking it might be time to revive the tradition. I’ve been feeling an absence of Christmas magic lately and so I’ve been trying to figure out how to get it back. Perhaps a letter to Santa is the ticket. 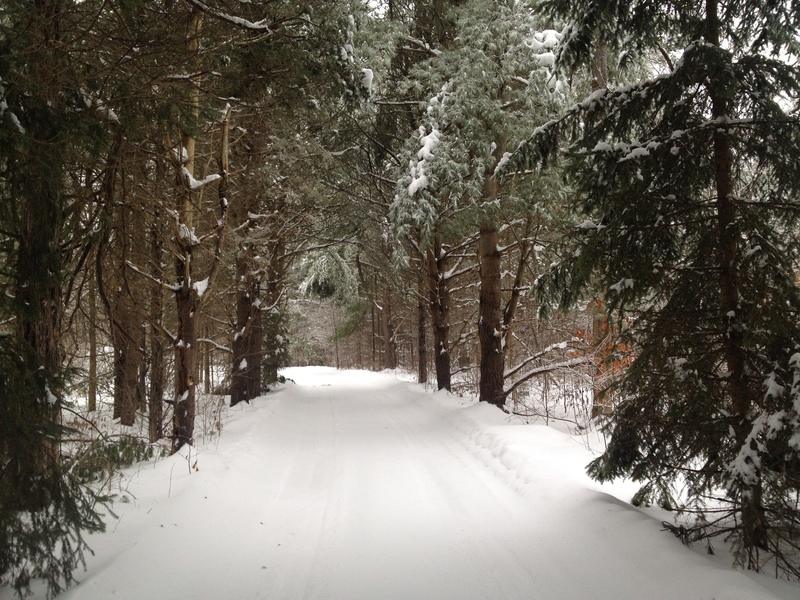 When I went out for my run today, I started thinking about what I would write in my letter. Have I been naughty or nice? What have I been most proud of that I would really want to tell Santa? Is there anything I would need to confess to him? More importantly, what big dreams and wishes do I want to send up to the frosty North Pole for the elves to work on? Last year, around this time, I sent a few wishes up north… and unfortunately, they didn’t come true. In the most spectacular fashion. But this year, I’m going to give the elves another shot. 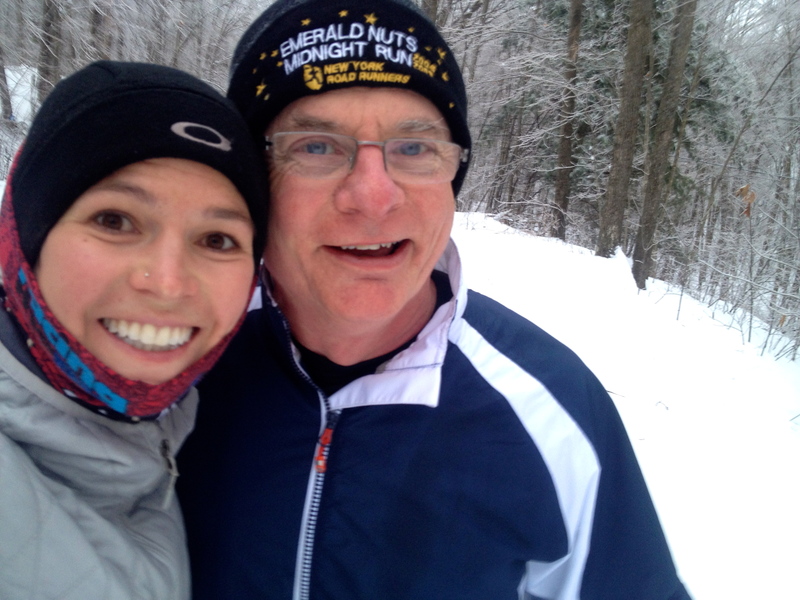 It is time to dream big, run far, and take another giant swig of egg nog. 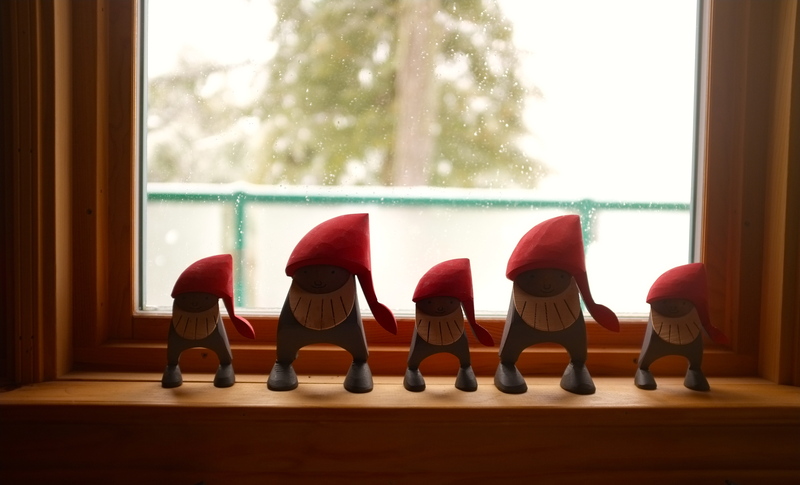 Our Christmas elves at the cottage… ready to go! What would YOU write to Santa if you had the chance this year? Would it be something big? Something running-related? Something tangible or intangible? I asked this question on facebook, and here are some of the answers I got… Feel free to add your own in the comments section! FK: Cure for cancer. Student loan debt paid. MH: Being able to give more money for charity. SH: World peace of course. KF: Our baggage! 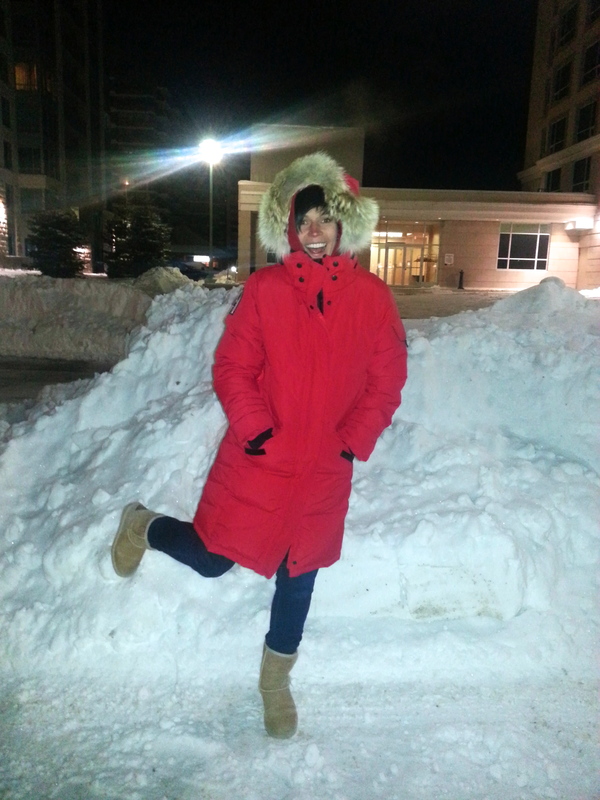 Just landed in Ottawa… and our bags didn’t make it. AB: What do you mean ‘if’?? DF: World peace of mind and a safe haven for non-combatants in Bor, preferably at the UN mission. CS: A very large donation to our charity. MZ: … a mulligan on the first six months of this year! Reminds me of the years when the grade 5 & 6 students used to write replies to letters sent to Santa by the grade one students. My wish for Santa would be for him to remind everyone to treasure the time we get to spend with those we love no matter what time of year. Oh wow, that’s a neat idea! And that’s a wonderful Christmas wish 🙂 Merry Christmas to you and happy new year! You’re hilarious 🙂 I think the wolves may be faster training partners, but you are more than welcome to run in my pack!